Looking for a small garden tree? Small trees are an important element to creating a coherent garden design; they also ensure your garden is private and that it looks beautiful throughout the year. And, with so many unusual (but low-maintenance) dwarf tree varieties out there, there really is no reason to rule out trees if your garden is small, too. We have selected the best small trees for compact outdoor spaces that deliver on both visual impact and ease of care, including evergreen small garden trees. Need more small garden advice once you've finished reading? Check out our 16 top tips for making small gardens feel bigger (and better). Acacia Dealbata is more commonly known as mimosa, and it's a real all-round winner for small gardens. Keep it potted up, and it makes a lovely, compact patio plant; if you live in a milder climate without severe frosts, plant it out in your garden, and it will grow nice and tall, as tall as eight metres, in fact. With its bright yellow, sweetly scented spring blooms and delicate leaves, it's a beautiful garden tree all year round. There are lots of different types of acers, or Japanese maples, out there, and many of them make excellent trees for smaller gardens. 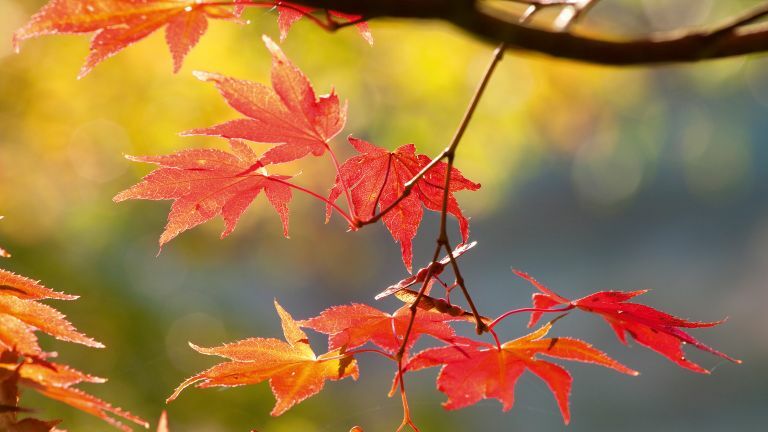 With their beautifully cut leaves that turn a blazing red in autumn, these are statement plants to add interest to a garden that will otherwise begin to look a bit sad once the summer is over. Acer palmatum is a particularly great choice for gardens that don't get very much light, as it's quite happy in shaded conditions. Think your garden is too small to have a fruit tree? Choose a dwarf variety, such as the beautifully compact 'Sylvia' cherry. Perfectly happy in a container, it looks quite different from your regular cherry tree, with clusters of cherries appearing up and down its slim trunk. It only grows to 1.5m tall, which is a bonus for very small gardens. Evergreens are great options for gardens of all sizes, adding interest to your garden in the winter. Platycladus orientalis 'Aurea Nana' is a fully hardy conifer with gorgeous, golden green foliage and a compact growing habit (will grow up to 90cm tall). Is there a spring-flowering plant more romantic than lilac? Beautifully scented and coming in a range of colours, from white to the deepest purple, lilac blooms are worth the long wait, and the typically short flowering period. This dwarf lilac 'Flowerfest Pink' is different – it won't grow massive, and it flowers twice in the year: first in the spring, and then again in late summer, all the way up to the first frosts. A perfect container plant. An autumn/winter garden star, this compact variety of witch hazel, Hamamelis x intermedia 'Pallida' explodes in colourful bursts of bright yellow and orange between December and February – at just the time when colour is scarce in the garden. It is also a low maintenance plant, happy in sun or semi-shade, and will grow up to four metres tall.